The majority of gamers feel that buying a gaming keyboard is a matter of personal taste before anything else. This certainly seems like a valid stance since gaming keyboards come in all shapes and sizes, where their backlighting plays a major role. However, what’s underneath those sturdy plastic keys also plays a very important role and those are key switches. Still, not everyone can afford world-famous Cherry Browns or Razer Greens. Don’t worry, there are lots of other interesting options out there, even if you’re on a tight budget. You’ve come to the right place since we are going to share our list of the best budget gaming keyboards. Even if you’re not a professional gamer, you probably know the importance of having a responsive mechanical keyboard. In fact, your gaming gear is what sets you apart from the others if you want to reach those high scores. On top of that, we are sure you know all about expensive peripherals that can be seen on professional gaming tournaments. Still, you don’t have to break the bank to find an amazing mechanical keyboard that will take you gaming experience a couple of levels higher. ✎ Read Also: 5 Best Gaming Headsets Under $100 – Crisp Sound, Stellar Quality! Before we jump to individual reviews, we present you our list of the best budget gaming keyboards you can currently find on the market. If you continue reading this guide, you’ll get to learn about some of the most interesting products from our list since we’ll take a deeper look at their specs. However, you’ll also get to learn more about why mechanical keyboards are so useful when it comes to gaming as well as a couple of other tips and tricks. So, without further ado, let’s check out the best budget mechanical keyboards. AULA’s mechanical keyboard is the most affordable product on our list that still manages to bring lots of interesting and useful features. Priced at $39.95, this definitely seems like an amazing deal since you’ll be getting a real mechanical keyboard powered by key switches. First, let’s talk about this keyboard’s design and build quality. It is surprising to see that AULA’s mechanical keyboard comes with the metal base that provides a very nice weighted feeling and keeps the keyboard grounded. We feel that this keyboard is quality made as well as that you’re going to use it for a very long time. When it comes to its design, it’s important to be said that a num pad is missing – which actually isn’t surprising considering the low price. However, you’ll be getting a set of responsive key switches and a very fun lighting effect. As said before, this truly is a mechanical keyboard. It is powered by AULA’s own key switches that provide a very nice typing experience. This keyboard isn’t very loud, so you can use it at your office if you need a mechanical keyboard for typing. In conclusion, this is a fairly basic gaming keyboard without any bells and whistles. Nonetheless, this truly is one of the best budget gaming keyboards since it brings all you might possibly need, at a very low price. In the gaming community, Tomoko is a well-known company that makes different kinds of budget gaming keyboards. In this guide, we’ll be taking a look at a fairly simple (in its design) keyboard simply called “Tomoko Mechanical Gaming Keyboard”. 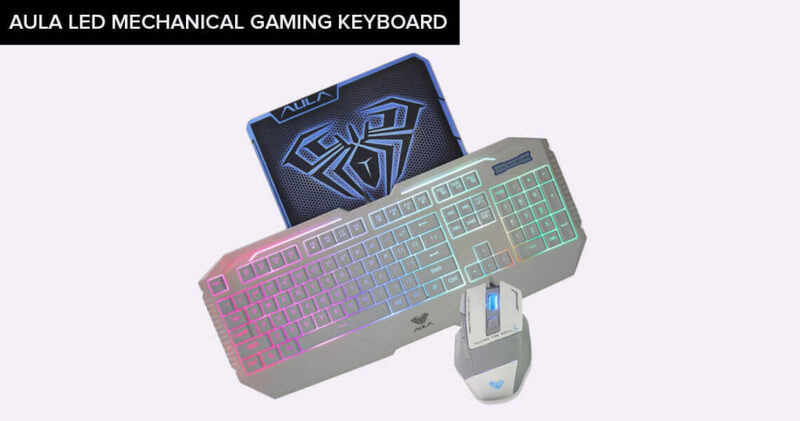 You can also find it named as “VicTsing Mechanical Gaming Keyboard”. Let’s take a look at what this product offers. Tomoko’s mechanical keyboard brings 104 keys, which means it’s full sized. The good news is that it comes with the sturdy metal base that keeps the keyboard grounded. There are several rubber feet as well, prevent any accidental movement. It’s also interesting to mention that you can find this keyboard’s sibling that comes with 87 keys if you don’t need a numpad. Tomoko is known for its Blue Gaote switches that provide a very tactile and responsive experience, even though these keys can be somewhat loud. There’s also the N-KEY rollover, which means that this keyboard won’t get confused if you press several keys at once. Instead, your computer will register all those signals, which can be a lifesaver is certain gaming situations. The only downside is that a wrist rest is missing as well as that there’s no backlighting. However, I am sure that some of you are not fans of colorful lights hidden beneath keys, which is why Tomoko’s keyboard is a viable option. 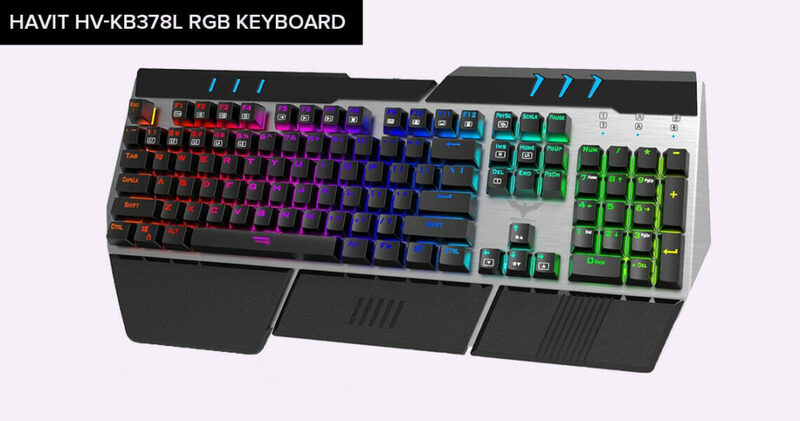 The K10 keyboard is a very colorful mechanical keyboard that comes with a full 104-key set. It comes with a gold ABS base-plate, which kind of really works with the rainbow lighting and creates an impressive pattern of light. Speaking of that light, you cannot change it, but you can choose from several different lighting schemes. This keyboard comes with Huano Blue switches, which is actually a very successful clone of the Cherry Blue switches. We are actually surprised by how well these keys work and how responsive they are. Those of you who are interested in mechanical keyboards for typing will be happy to know that the K10’s keys have a light activation weight, so you don’t have to push too hard to activate a specific key and its signal. It is also important to be mentioned that the SADES K10 keyboard is ergonomically designed. 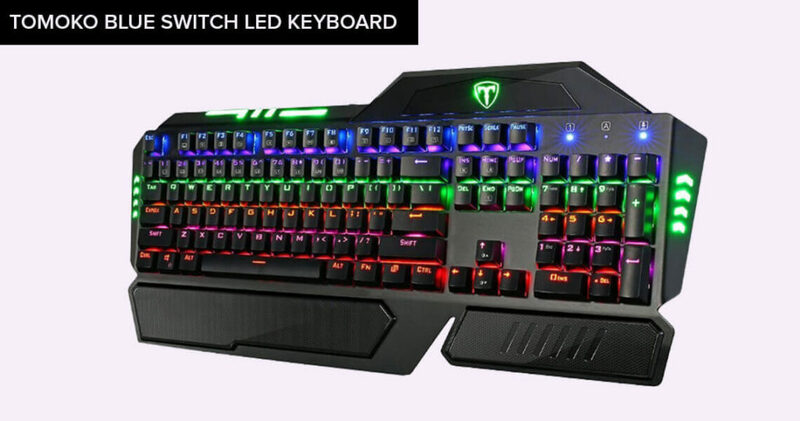 According to its manufacturer, this keyboard and its keys were tested by hundreds of professional gamers, and we definitely believe that. When it comes to comfort and ease of use, the K10 can be compared to much more expensive products. Needless to say, this is definitely one of the best budget gaming keyboards. For the price of around $60, it is amazing how many useful features HAVIT’s HV-KB378L keyboard has to offer. And yes, we’re not fans of its generic model name but believe us when we say that this keyboard is far from generic. Perhaps one of the most interesting things about this keyboard is that it offers full RGB backlighting. What this means is that you can customize every single key’s color, as well as to create specific colors and different patterns for different games. In addition, there are six brightness levels and six preloaded patterns to choose from. This actually is a very fun keyboard to have around. Among other features, this keyboard uses Gaote Blue switches, made to imitate the famous Cherry Blue switches. These keys are quite loud and they provide a strong tactile feedback, which means that those of you who like traditional “clicky” mechanical keyboards are going to love this product. We also must not forget to mention a sturdy metal base with a built-in wrist rest. We guarantee that you won’t even feel tired after those long gaming sessions. We ought to finish this list with one of the most quality-made budget gaming keyboards out there. This one is priced just under $100, so it’s not the most affordable, but the price is well worth it. 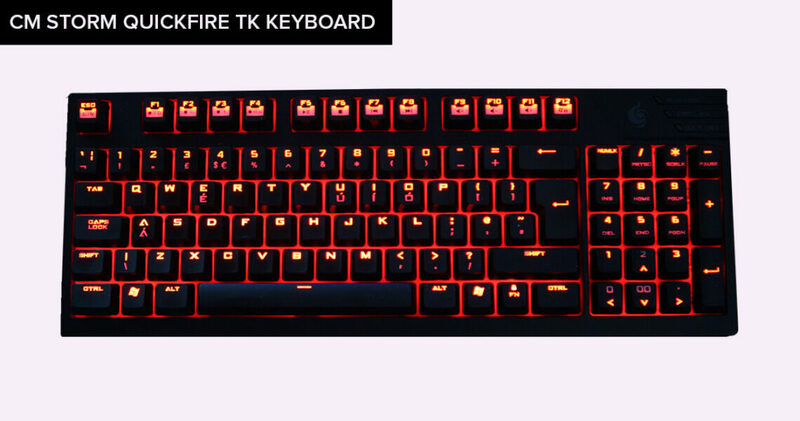 The Storm QuickFire TK is made by the well-known Cooler Master and this keyboard has been one of the most popular mechanical keyboards for several years now. Perhaps the biggest reason for this are the original Blue Cherry MX switches. As you know by now, this is the only mechanical keyboard under $100 from our list that brings the original Cherry switches. Another interesting piece of information is that the Blue Cherry MX switches are tested for 50 million keypresses, which means that this product will handle years of hard action. For those of you who are not familiar with the Blue Cherry MX, these keys are very tactile and responsive. They are not too hard and they can accept signals even half-pressed in certain cases. This means that games that demand a lot of double-tapping of half-pressing are perfect for the Storm QuickFire TK. 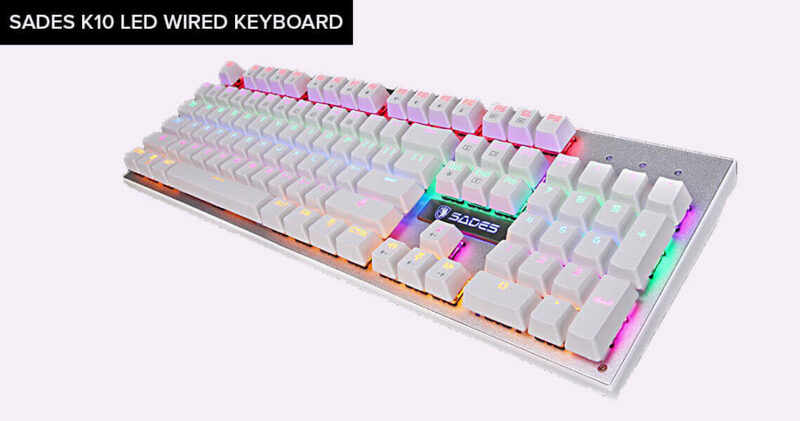 Among other notable features, the keys are laser-etched and they provide RGB lighting that is programmable and comes with several patterns out of the box. 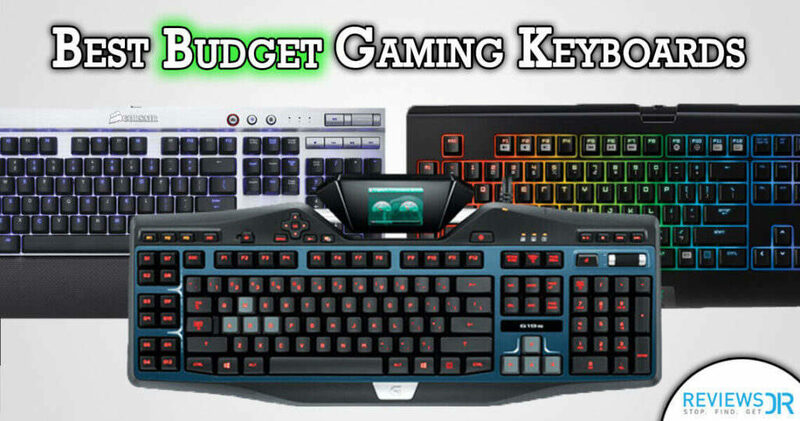 Should We Buy Budget Gaming Keyboards – Are They Worth the Money? What makes mechanical keyboards so special? All keyboards are mechanical in a certain sense. What this means is that underneath their keys are mechanical systems that make those keys “bounce”. In other words, when you press a key it returns to its original position. However, there are two main categories of keyboards and their mechanical system is what makes them different. ✎ Read Also: 5 Best Cheap Gaming Mouse To Buy In 2017 – Surprisingly Cheap! Traditional keyboards typically come with rubber domes or other springy material that makes the key go back to its original position (or height). Mechanical (gaming) keyboards actually contain a more robust construction that is based on technologies from the 1980s. They have different kinds of springs made of plastics and silicone, and they are highly durable. In fact, the majority of gaming keyboards are rigorously tested to handle up to 50 million key presses. Why are mechanical keyboards great for gaming? What’s interesting is that even casual gamers can notice subtle and obvious differences between traditional and mechanical keyboards. They are very responsive, which means that you will hardly miss the right key at those action-packed gaming moments. They are easier to use since they usually have a backlight that makes it easier to see different keys and their functions. In general, mechanical keyboards are more expensive than the traditional ones, but they are certainly worth the price. Don’t be afraid to spend a bit more money, since the best budget mechanical gaming keyboards can last for a very long time. As previously said, mechanical keyboards can be very pricey. Still, this isn’t the reason not to do some research and find some viable options. We hope that thanks to this guide, you will find the right pick that won’t hurt your budget. Let’s take a look at several suggestions for the best budget gaming keyboards under $50 and under $100. Aside from mentioning the keyboards we previously reviewed, we’ll show you several examples of the best budget gaming keyboards under $50. All of the following keyboards are quality made and they bring features like backlighting and custom-design switches. If your budget is around $100, you have a few additional options when it comes to different functions and key switches. On top of that, you will be able to find some authentic Cherry switches, known for their responsiveness and longevity. What to Look for When Buying Budget Gaming Keyboards? If you are looking to buy a mechanical keyboard, you should know what kinds of things are important to know. Not every gaming keyboard is the same, so we’ll talk about the most important differentiating factors. Are you looking for a mechanical keyboard for gaming or productivity? You should know a bit about different key switches and how they interact with different keys. For example, if you plan on typing often, you need to find the right kind of key switches that are not too hard nor too loose. Even though Cherry’s MX switches are considered to be very best when it comes to mechanical keyboards, you need to know that there are numerous good clones. It’s good to have the original, but you won’t make a mistake if you buy a clone. For example, every one of the keyboards we previously told you about is quality-made and they are very responsive and tactile. Just a couple of years ago, backlighting was reserved for premium priced keyboards. However, that’s no longer the case. While some keyboards have a fixed lighting with a couple of different patterns, the most useful are those with RGB lighting. Those keyboards have lights under every single key, where you can program those lights and create your own custom patterns. The majority of premium priced mechanical keyboards have additional ports like headphone and microphone jacks in addition to additional USB ports. This can be really helpful since it allows you declutter your desk, so you should also take a look at this feature. Have You Made Your Pick For The Ultimate Budget Gaming Keyboard? As every reputable gamer will say, your keyboard is an essential part of your gaming setup. As you now know, quality-made keyboards are not expensive anymore and everyone can afford one. Even under $50, there are dozens of great options. We sincerely hope that you enjoyed reading our guide on the best budget gaming keyboards as well as that you’ll listen to our advice. In case you have something to say, don’t hesitate to post a comment. We’ll try to answer your questions and include your opinion into future revisions of this guide. I an avid gamer and after reading this article, I decided to shift from standard keyboard to mech keyboard because recently I bought the normal keyboard and its some of the keys stick, and others will print the character twice. Nightmare to play any game. I have the aula led mech gaming Keyboard. Now for two years and I love it. The feeling of shifting from regular keyboard to mech was a little weird at first, but now I would never go back to anything else. Well, The right gaming keyboard ultimately comes down to the right feel while you’re playing. Membrane switches are familiar, now often spongy. Mechanical keyboards offer key switches that are responsive when typing or moving in a game, and feel good to push down easily and comfortable. That feel is important, because the keyboard is the peripheral you’ll spend the most time with at your PC or Laptop, and it has to feel right. We tested a wide range of keyboards, membrane and mechanical, to find the ones that felt best for gaming. Thanks to Reviewsdir to provide a best list of gaming keyboard provided. The right gaming keyboard will make you a better professional gamer. That being said, it can be difficult and down right impossible to find which is the Best Gaming Keyboards for you. Now the very helpful article found in Reviewsdir and a short list of Gaming Keyboard to help you decide and choose the best one.